Raise your organization's productivity and morale with the proper EAPs! The development of employee assistance programs (EAPs) was one of the 20th century's most important workplace innovations. Emerging Trends for EAPs in the 21st Century examines the evolution of EAPs from their origin as a way of dealing with alcoholic employees to the multifaceted EAPs in the modern workplace. Today's EAPs serve employees affected by a great number of stressors related to the rapidly changing environment of today's workplaces as well as stressors related to the balancing of work and family issues. Emerging Trends for EAPs in the 21st Century stresses the important advantages to be found in working from a strengths and solution-oriented case management approach, rather than an assessment and referral model, and of considering individuals “challenged” rather than “troubled.” Thus, you will learn that trauma and abuse, illness and struggle may be injurious, but they also may be sources of challenge and opportunity, and you'll see that every individual, couple, family, group, organization, and community has strengths that can be fortified to help those who need it. 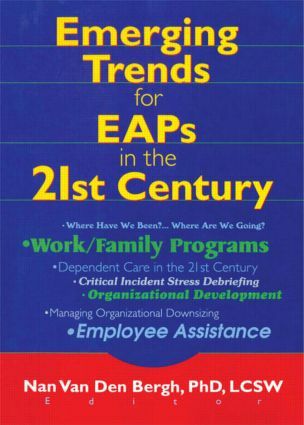 Emerging Trends for EAPs in the 21st Century offers insightful commentary, pragmatic information, and predictions for the future of employee assistance programs as we move into the 21st century. Employee Assistance and Work/Family Programs: Friends or Foes?